An innovative photographer offers a new perspective on America's national parks. 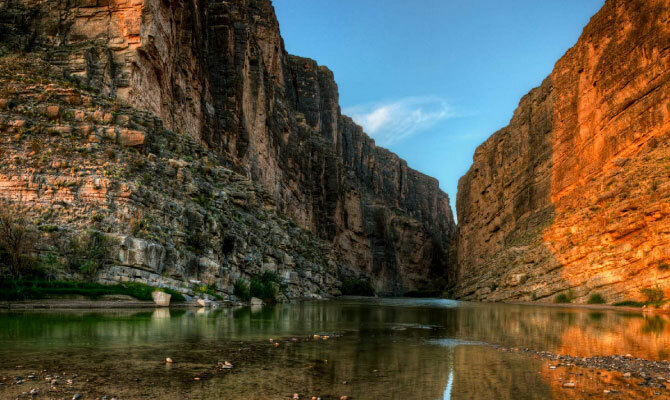 In the hushed November darkness, Bruce Ellingson stands alone in the shallow waters of the Rio Grande. He's spent three days waiting and hoping that his journey isn't in vain. Then it happens. As the last vestige of night slips away, a gleam of sunlight hits the towering cliffs, burnishing Santa Elena Canyon to a fiery orange glow. Click. Click. Click. Ellingson captures the moment-and the breathtaking light. That particular sunrise occurred in Texas, but it was one of about 50 that Ellingson witnessed last year over the course of a 20,000-mile odyssey through 12 national parks and monuments in the American West. Just like previous generations of artists and photographers, Ellingson gazed in awe at iconic scenes that have appeared in countless images. Then he took photos the likes of which have never been seen before. Ellingson, 99PhD, took a nine-month sabbatical from his job as a professor of media studies at Storm Lake's Buena Vista University to explore the creative results that occur when old traditions meet new technologies. Traveling through 17 states-from the painted vistas of South Dakota to the verdant peaks of Montana to the sculpted rock formations in Utah-he experimented with high dynamic range (HDR) photography, sharing his images and experiences through social media like Facebook, Twitter, and Flickr. HDR photography, which produces incredibly luminous, detailed, vibrant images, proved perfect for showcasing these national natural treasures. In shots that seem more like paintings than photographs, shadows are intense, the light radiant, and the landscapes realistic yet otherworldly. As one fan posted on Ellingson's Facebook page, "It's as if you are magically capturing a dream." Even in the midst of nature's magnificence, scenery is a secondary consideration for this photographer. In fact, Ellingson often refers to his subject matter as "lightscapes, acknowledging, "For me, it's all about the light." 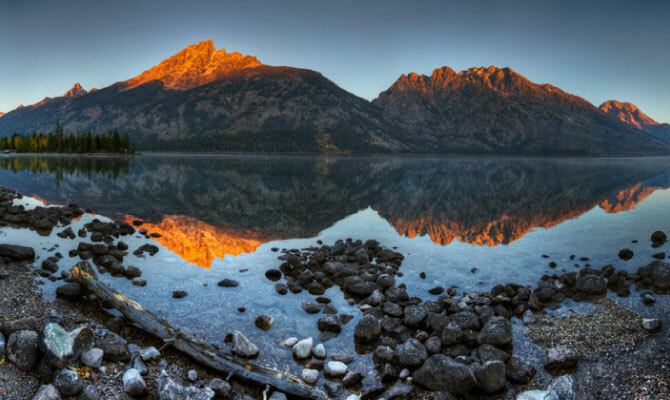 Many of his national park images reflect dawn's early light or twilight's last gleaming, those transcendent times of day when the sky glows like a pearl or blazes like an inferno. During one particularly spectacular sunrise over Norbeck's Peak in South Dakota's Badlands, Ellingson felt he was witnessing the dawn not of a new day, but of Creation. In the 19th and 20th centuries, pioneers like landscape painter Albert Bierstadt and famed photographer Ansel Adams transformed the American public's view of the West. Through their depictions of the stunningly beautiful land, the wilderness shed its reputation as a hell and became a paradise. Similarly, Ellingson's work presents the land in a new way. Although he grew up on the edge of the Great Plains, on a farm in Minnesota, Ellingson has long turned his eyes toward that untamed West. The exploits of his childhood heroes-including explorers Zebulon Pike and Lewis and Clark, along with television and movie stars like Roy Rogers, Wyatt Earp, and John Wayne-intensified the romantic attraction of America's last frontiers. National parks are a natural extension of that interest, he says: "If you want to explore America now, you have to go to the national parks; everything else has been overtaken by people." A couple hundred years ago, explorers would disappear into the wilderness, not to be seen or heard from for months or even years. Not so today. Even in the middle of nowhere, Ellingson and his travel partner-his wife, Marge, who accompanied him on the trip in celebration of their 40th wedding anniversary- discovered that civilization was just a satellite connection away. Whereas pioneers wrote in paper journals, the Ellingsons kept an electronic account of their travels via Facebook. And while the public usually had to wait months to see the work of 19th-century artists or photographers, Ellingson could post his images on Flickr and receive feedback within hours or even minutes. This sense of connection to friends and family helped the Ellingsons adapt to the demanding routine of their road trip. Traveling-and often sleeping-in their minivan, they spent two weeks at a time on the road collecting images, followed by two weeks back home to wrap up the shoots. In traditional photographs, time stops for a split second-the fleeting moment when the camera lens closes. In contrast, HDR photography effectively pauses the world for several minutes, condensing all those shapes, colors, tones, and light into one densely layered image. After aiming his Canon 5D Markii and 24-105 F4 Canon zoom at a particular view, Ellingson takes three versions of the shot-one at the correct exposure, another under-exposed, and the final one slightly overexposed. Afterward, he moves the camera slightly to the right and brackets another three exposures. Then he repeats the process over and over again, until he's encompassed the entire scene. Later, in his studio, he uses image editing software to merge those dozens of shots and exposures into one seamless panorama. Not simply stunning, these panoramas are unique. "Nothing the same as mine exists as a single whole image, Ellingson explains. Of course, it takes more than a sophisticated camera to create great photography. Beyond technical capability, Ellingson possesses an artist's eye-the vision to see what others overlook. He says that he inherited the clinical objectivity necessary to size up a potential image from his mother, a nurse. His father passed on other gifts. "He was a farmer, Ellingson says, "and I know that I see the morning light and the lay of the land through his eyes. He also knows that the mark of a true artist is authenticity. Even when he literally stands in Ansel Adams' footsteps-like the day he found himself in a pack of some 200 photographers crowded in an overlook along Wyoming's Snake River-Ellingson creates reflections of reality that are unmistakably his own. Those other photographers followed step-bystep directions in guidebooks to ensure they exactly duplicated one of Adams' legendary shots. Yet, by doing so, they missed the chance to fully experience the wonders of the scenery in that particular moment and from their own, distinct perspective. "You have to be true to yourself, and not mimic others", Ellingson says. "You have to divest yourself of the millions of images you've seen in a lifetime. Even if I'm in the same place as other photographers, I don't end up with what everyone else has done before." Usually, Ellingson prefers to avoid such tourist-infested areas. After exploring first by van, he hikes into the park and, in a process almost like walking meditation, tries to connect with the essence of the landscape. When necessary, he takes extreme measures to get the perfect image. At one point in their travels, his wife took a photo of Ellingson standing on the wrong side of a barrier in the Badlands. A crowd of tourists gapes as he stands just feet from a precipitous drop and coolly lines up his shot. The perfect image requires what Ellingson terms "dynamic weather" or "atmospherics-the interplay of light, texture, and movement found in clouds, fog, and steam." One day last August, he watched in awe as a massive white cloud reared up in the dazzling blue sky and dashed itself like a wave against the distant rolling brown hills of Yellowstone's Electric Peak. "Sometimes, I think Nature performs just to see if anyone is watching", he wrote in his Facebook post that day. "[It was] one grand natural performance just for me." Now back home in Storm Lake, Ellingson makes prints of his national park images the old-fashioned way, by hand. He works on turning his panoramas into a book, tentatively titled with the same phrase he used during his trip to sign off e-mails: Waiting for the Light. Those simple yet profound words reflect Ellingson's singular passion and vision. Until he's too old to climb a hill or hold a camera, he plans to keep trekking into America's amber waves and purple mountains. He'll make deep connections with these natural treasures, and he'll bring back photographs to share-images to transfix the mind and illuminate the heart.